Screenshot from Kellie Leitch’s recent bizarre campaign video. Leitch is referring to the sanctuary city policy enacted by some cities that allows undocumented residents to access city services free of interrogating questions. Toronto declared itself a sanctuary city in 2014 and, earlier this year, voted to reaffirm its status as a sanctuary city. Despite being passed by Council, this status has served as a symbol more than anything else. A report released earlier this year outlines the struggles undocumented Torontonians face in accessing City services. Undocumented refugees report being asked to leave multiple City-run shelters because they did not have immigration papers, something that should not happen in a sanctuary city. “One law for all” is a dog whistle to imply that the country must be protected from Muslim immigrants; because it is them, in her eyes, that seek to overthrow the state and impose sharia law on the Canadian population. She has clumsily repurposed this language to portray sanctuary cities as breaking Canadian immigration laws by “protecting” undocumented immigrants. 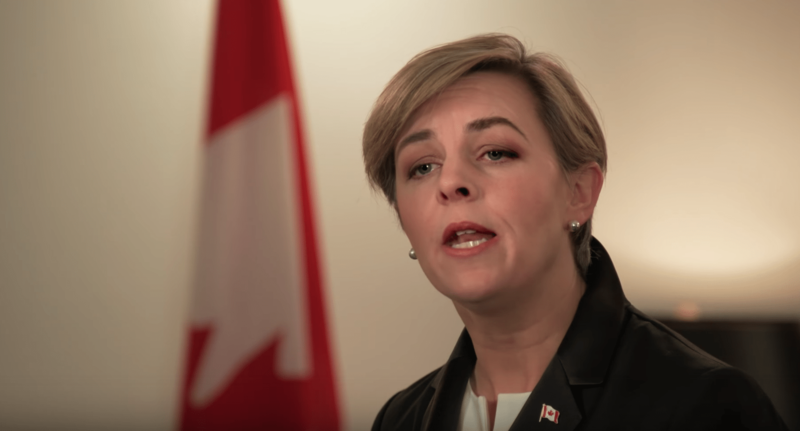 It does not matter that sanctuary cities do not exist in practice, or that Leitch’s use of “one law for all” is inconsistent and nonsensical; the politics of white nationalism do not require facts. Every day of Donald Trump’s presidency is a testament to this. If you were to ask people in this country what Canadian values are—it would vary from person to person. National identities, especially those of settler colonial states do not have preset values attached to them. Everyone’s idea of what it means to be Canadian varies; to some it’s about drinking Tim Hortons, playing hockey, and loving multiculturalism—the cute stuff that makes us quirky—and to others, like the Indigenous people of this land, the idea of being Canadian is one borne out of genocide and colonialism. To Leitch’s followers, however, Canadian values are defined differently. Leitch’s “Canadian values” are based upon a historical imagining of Canada, a place where Indigenous people did not exist and where European settlers made a country using only their hard work and unmatched intellect. This narrative tells a story of a white utopia that is soon disrupted by liberal politicians who bring in immigrants in order to fill “quotas”—immigrants who soon set out to destroy the country. The values of “hard work,” “gender equality,” “one law for all,” etc. are less a reflection on what “white Canadians” have, but on what immigrants are perceived as not having. The undocumented immigrants who supposedly benefit from sanctuary city policies are part of the latter group, seen as contributing nothing to society and assaulting Canadian values as a result. This is obviously not true. But white nationalism does not require the truth; in fact, it necessitates its absence. It’s clear to Kellie Leitch that cities like Toronto and places like Scarborough, with large immigrant populations, are places where Canadian values do not exist. To her, they represent the need for a campaign to take back Canadian identity; a Canada that has been lost to the “other.” They are cold places where neighbours live isolated lives, not willing to lend a cup of sugar to each other. Leitch does not understand Canadian cities, but rather than understand them better and be a leader for all Canadians, she has chosen to place diverse cities like Toronto outside the context of Canada. They are outliers that need to be ignored or actively resisted using “Canadian values”; and this is what she aims to do with her promise of denying sanctuary cities transit funding. Scarborough in particular (which happens to be quite diverse) is in dire need of transit funding. Residents have been consistently let down by all levels of government. If Leitch has her way, this problem would only get worse. To combat Leitch’s narrative, it’s important that we call out Kellie Leitch’s “Canadian values” campaign for what it is, a blatant campaign of white nationalism that seeks to define who is “Canadian” and who isn’t. As citizens in a setter colonial state, it is crucially important that we interrogate questions of what it means to be a Canadian and that we deal with the contradictions that exist in such a label. We need to have this conversation, difficult as it may be—or else people like Leitch will get to set the narrative.